It’s screen free week here and we’re not doing to bad. Gav has asked a few times if he can watch this or that but it hasn’t been met with much whining at all. So the other day, while Gav was begrudgingly doing his rest time, I whipped up a new sandbox for him. 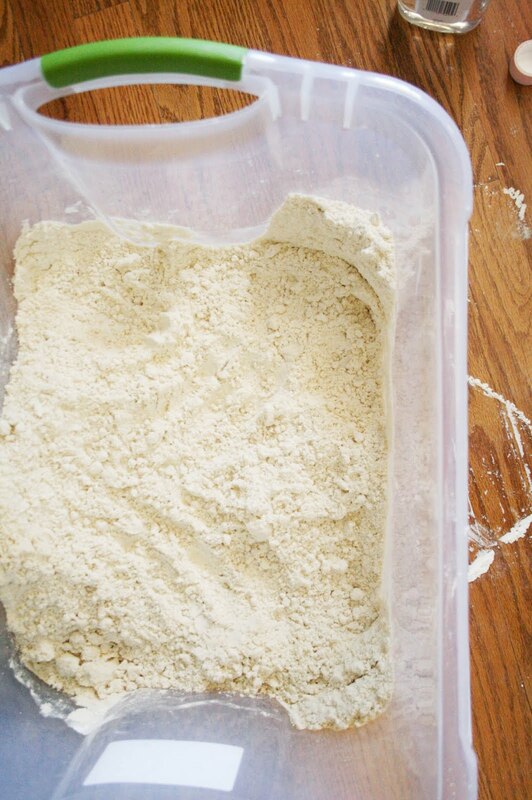 Following THIS recipe, I made some homemade moon sand in a deep storage bin I happened to already have. Then all you have to do is bury some of the toys, place some on top to play with and you’re ready to go! Just make sure this is strictly an outdoor activity. It gets messy! Our old dino Jello mold, which really was terrible for Jello, worked great with the moon sand. Other items that are fun to use are measuring cups, silicone baking molds, and sifters. Also, note to self, don’t wear black while playing in the “sand” box.